If you are preparing for PMP certification (Project Management Professional certification) exam, one of the major project management process group to learn in detail is Project Risk Management. 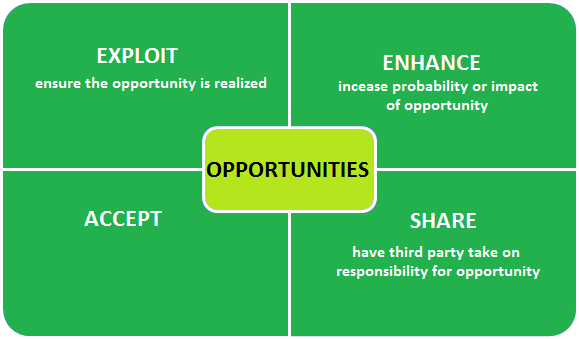 A project risk can be either a negative risk named as a threat or a positive risk aka opportunity. 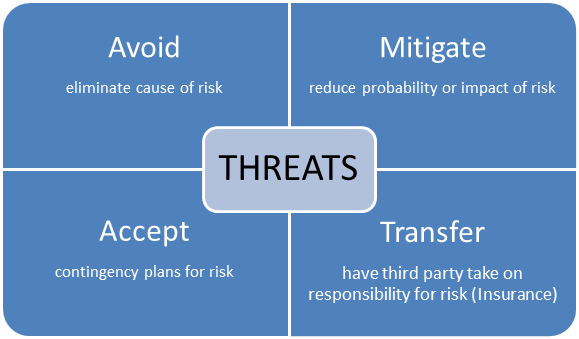 According to the type of the project risk, project manager or the project team can choose one of the risk response types to deal with the risk. Here is the list of risk response types for project teams to choose from when dealing with project known-unknowns which can affect the project in a negative manner. Keep this list in mind while answering questions in PMP certification exam. Although frequently the positive risks are passed over during project risk management process group by project teams, there are risk response strategies that can be applied to increase the probability or the impact of a positive risk aka opportunity.